While Hot Winter Hot Sauce is made locally, here in Portland, we began our product while working at Mountain Home Farm, in Humboldt County, CA: deep in the heart of the legendary State of Jefferson. 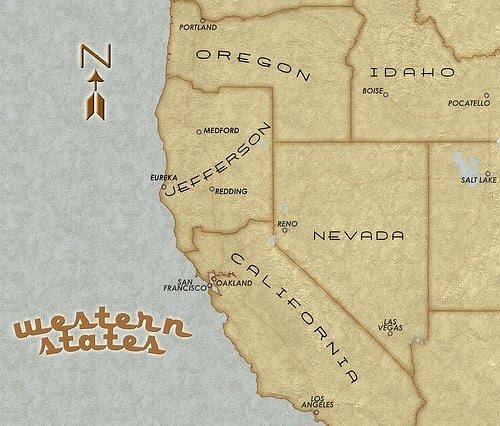 Composed of parts of southern Oregon and what is now northern California, this region attempted on numerous occasions in the 19th and early 20th centuries to put forward its own statehood. While such efforts at sovereignty were cast aside amidst the tumult of the First World War, a free spirited independence still permeates the land and encourages boldness in its people. Even among the dozens of pepper varieties grown at Mountain Home Farm, the Jimmy Nardello seemed special. A sweet pepper with very little water content, the Jimmy Nardello is surprisingly delicious. The Slow Food movement agrees, having named the pepper to their esteemed “Ark of Taste”: a catalog of heirloom fruits and vegetables meant to represent our nation’s culinary heritage. It was in our Jimmy Nardello field that the first Hot Winter pepper was found. An off-type Jimmy was suddenly producing hot peppers! The quality and complexity of this fruit led to several years of plant breeding experiments to cultivate our ideal pepper. We were already making small batches of hot sauce on the farm, but the addition of our Hot Winter pepper led us to think we had a product worth sharing.